Russian entrepreneurs have launched something similar to Handy, the U.S. home-cleaning service. In the past year, Qlean has attracted more than $327,000 in investment, and in the near future the young ambitious service plans to expand to Asia. Presently, Qlean employs 200 cleaners and receives about 200-260 cleaning orders each day. Now the company plans to enter the world market, primarily in Asia. According to Prostor Capital investment analyst Sergei Akashkin, to succeed in the global market Qlean needs to borrow Handy’s experience and expand its services. The U.S. service, which was Qlean's prototype, offers furniture assembly, installation of cornices, electrical appliance installation, and garbage removal. “The start-upers need to make a significant breakthrough in Russia and the CIS, increase returns, refine the business model to the slightest detail, and only then think about global expansion,” said Akashkin. Qlean was launched in late 2014, and the founders thought through their business model by working as cleaners themselves to understand how many apartments one person can clean in a day, and they also tested cleaning products. This preparatory period lasted eight months, and initial investment amounted to 1 million rubles ($15,500) of the founders’ own funds. The website www.qlean.ru is very similar to www.handy.com in its interface, options, and even design. Just as on the U.S. website, the price for services is formed depending on the number of rooms and bathrooms rather than the apartment's total area. The minimum cost of cleaning a studio apartment is about $23. This price includes washing floors, cleaning shower stalls and toilets, removing dust from surfaces, dry vacuuming, and taking out the garbage. The company also provides additional services for a fee – ironing, washing windows and the refrigerator, as well as cleaning a balcony. “If the customer is dissatisfied then our manager finds out the reason, and we penalize the offending employee and make a repeated cleaning for free,” Vias says. After cleaning, users of the website www.qlean.ru rate the cleaner’s work on a five-point scale. Employees who earned the highest total rating are first to receive future orders. The main problem faced by Qlean's founders was the lack of professional and conscientious workers. At first the company was looking for cleaners through free classified websites, but to no avail. Most of these people were bad at using the Internet and did not always perform quality work. Eventually, Qlean's founders created a special page on their own website for applicants, and promoted it through Yandex Direct. As a result, people with higher education, who would like to have a side job of four to eight hours a week, began to appear as candidates. A cleaner is checked in several stages; first, a telephone conversation with the HR manager, then testing, and finally a background check. Qlean checks the papers of applicants, as well as whether they have a criminal record or administrative offenses, then analyzes their accounts on social networks. About 90 percent of applicants fail testing for one reason or another. Cleaners who were pre-qualified undergo training and confirm their competence through regular test-taking. 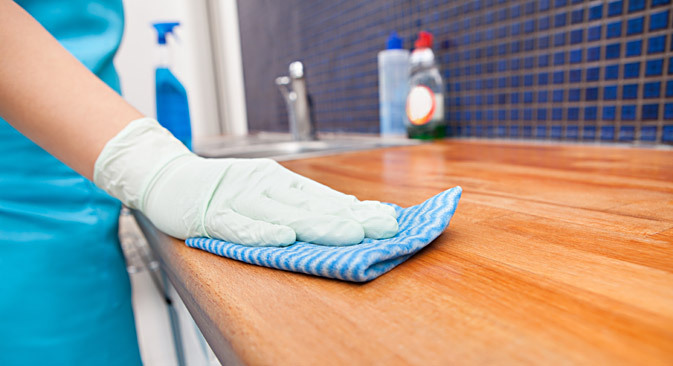 Novice workers come to their first two cleanings with an experienced cleaner, who controls the process and corrects mistakes. If an employee damages or breaks any property in the customer’s apartment, Qlean reimburses losses.